Enormous arthropods and dinosaurs that looked like ostriches are among the fossil finds that captured your imagination this year. Every year, scientists uncover more new clues about what life was like across the ancient West. Each new specimen seems to reinforce the fact that life has taken forms that were at once strange and familiar. And these finds also remind us how much the West itself has changed — from being mild and temperate to humid and tropical, from being covered in lush forests to being submerged under primordial seas. Our list begins a half-billion years ago, when North America was on the equator, and the vast majority of the United States was under water. 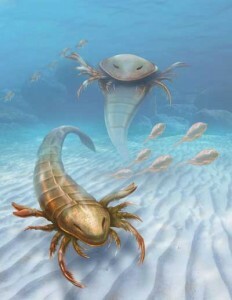 The apex predator of this watery world was a giant sea scorpion — as big as a grown man, with eight nimble limbs, and a tough exoskeleton. Paleontologists recently discovered the animal in a fossil in Iowa, and the creature turned out to be the oldest of its kind ever found, and also one of the largest. The body of the newly identified species — given the name Pentecopterus — is so well preserved that the researchers have been able to observe some of its smallest structures, like the joints in its legs, and the tiny hair-like structures that lined many of its limbs. Read on to get a close look at this antediluvian predator, and discover what this fossil has taught us about these enigmatic creatures (including how it really walked!). A recurring motif among this year’s top fossil finds is dinosaurs with feathers. Not all dinos had them, but two “exceptionally large” specimens discovered in a rock quarry in South Dakota certainly did — and their exquisite state of preservation is providing all sorts of new data about life in the ancient West. The two animals represent a previously unknown genus of dinosaur, dubbed Dakotaraptor, and they’re the most historically recent raptors found anywhere in the world. If you’ve ever wondered how paleontologists know that some dinosaurs had feathers, Dakotaraptor will show you at least one way — its well-preserved arm bones include evenly spaced bony lumps, or bosses, that scientists say is the “first clear evidence for feather quills” on a large raptor. And yet, at about 5.5 meters [17 feet] long, Dakotaraptor couldn’t fly. So what were the feathers for? Read on to find out, and to learn what other insights these animals are providing, from the nature of Cretaceous food webs to the evolution of flight in birds. So, some dinosaurs may have borne some resemblance to modern birds, at least in terms of their plumage. But what about their behavior? Paleontologists in Montana and China got a rare glimpse into that, too, with the discovery of two preserved dinosaur nests suggesting that at least some species re-used their nesting sites every year, much like birds. 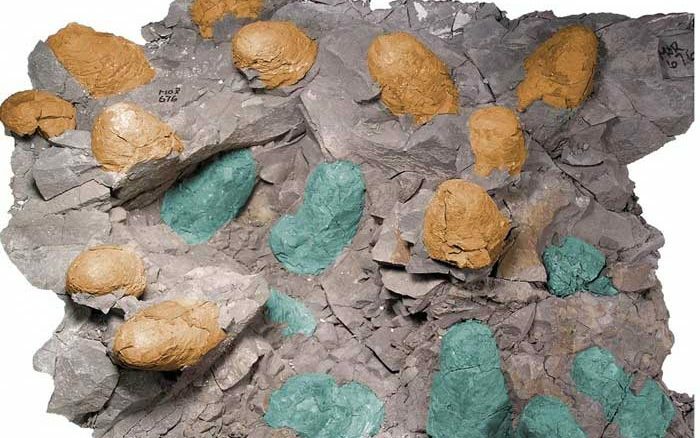 Although the nests were found half a world apart, both contained the fossilized remains of multiple egg clutches, apparently laid in close succession. And both belonged to the theropod dinosaurs known as troodontids — small, two-legged, meat-eaters thought by some to be among the most bird-like of extinct dinosaurs. Together the two nests provide the clearest signs yet of site fidelity — that is, the re-use of a breeding site — by dinosaurs. Read on the see the nests, which paleontologists described as “remarkable” in their preservation, and learn more what they can teach us about the evolutionary relationships between birds and extinct dinosaurs. Of course, paleontology covers the study of much more than dinosaurs. 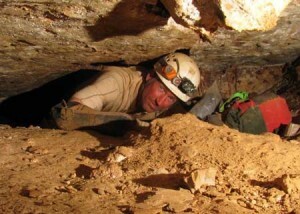 Just ask researchers in South Dakota, who have their hands full with countless specimens of animals from the Ice Age, following their excavation this spring of a newly discovered cave in Wind Cave National Park. Originally found by a park employee, the cave turned out to contain hundreds of thousands of fossil bones, including the remains of camels, prehistoric horses, bison, and more than 40 other species dating back as much as 11,000 years. It took more than two years for researchers to figure out how to access the cave, because it was surrounded by thickets of poison ivy and filled with nesting rattlesnakes. But scientists are now wheedling information from the site — like new data about the large, one-humped camel Camelops, North America’s now-extinct native horses, and some creatures that are only seen in climates much colder than South Dakota’s is today. Check out our interview with the lead researcher of the cave dig, and see the tally of all the ancient life that’s been found there so far. But by now, you might be able to guess what topped our list of paleontology stories this year: more fossils with feathers! 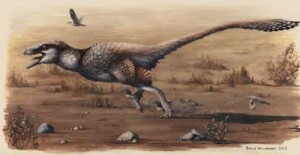 But the recent discovery of one of these big, feathered theropods in southern Alberta showed us just how apt its name is. Together, these new features are providing the fullest depiction yet of the plumage sported by Ornithomimus, and it turns out to have borne a striking resemblance to at least one living bird: the ostrich. This could teach us volumes about the physiology of Ornithomimus and other dinos like it, especially how they regulated their body temperature in the warm climate of their day, some 75 million years ago. 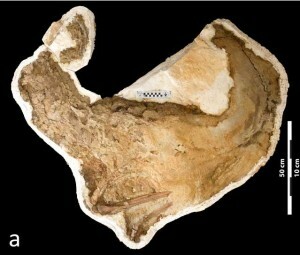 Readers on reddit, tumblr, facebook vaulted the news of this specimen far to the top of this year’s paleo-charts: Have a look at the fossil and learn more to find out why! And thanks to everyone who stopped by Western Digs this past year, to give us our biggest year yet. Whether this is your first visit or you’re a regular reader, we hope you count yourself as a member of the WD community in the coming year.